I have to admit that I have become a big fan of the naval books that Squadron has published in recent years, and really liked the first one in this series on the USS Alabama (BB-60). I have the one on Essex Class carriers (Squadron/Signal # 4010) as well as the "Detail and Scale" volume on the Lexington itself (D&S #29), but I am happy to say that this book provides totally new and fresh photos and descriptions as compared to those two volumes. 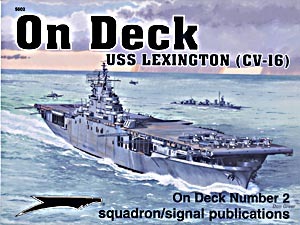 The photos selected have a very good cross section of the main points of interest most modelers have with carriers, namely the flight deck, hangar deck, and armament details, but Mr. Adcock also provides a number of lesser seen elements such as the various compartments in the island used for command and control of the ship in combat, pilots' ready rooms, berthing spaces, and other sections not commonly seen or understood by the public. The timing of a third good reference on this particular ship is very good, as sharp-eyed modelers will probably have noticed that the Chinese company Trumpeter has announced that they are following up their release of a 1/350 scale model of the USS Hornet (CV-8) with a 1/350 model of the USS Essex (CV-9) in her WWII configuration. Books like this will be a boon to anyone who wants to do a good WWII version of either the Essex class carriers or the USS Lexington itself. Thanks to Squadron/Signal for the review copy.